Most creative people have a little foible or two. But over the years I've had more people ask me about my bare feet than I've had hangovers; and now you know what a large-scale problem this is, I've decided to address it. Is it because I can feel the music more with my naked skin touching the ground and feeling the vibrations? No. I'm not that clever. Dame Evelyn Glennie can do this - but even though she is a percussionist, she is actually very clever; and also profoundly deaf, so she had a good reason to learn that skill. Is it because I connect more with the music? No. That is just a silly idea and anyone who says that is more pompous than Jacob Rees-Mogg - and that's a difficult task to achieve. Is it because I get hot waving my arms around, so this helps cool me down? No. I mean, yes I do get hot, and yes, it probably does keep me slightly cooler than a pair of Church's formal black patent leather shoes with Paul Smith formal black cotton socks - but that's not the reason. Is it because it's cheaper? Now we are just getting to the ridiculous; of course having no shoes is cheaper than having shoes; especially Church's - but that's a silly answer to a stupid question. Is it to gain attention? No. I can do that without my feet thank you very much. I've never been very good at dancing, and I don't have especially beautiful feet, so I wouldn't naturally highlight them. Back in 2010 I was young and foolish. 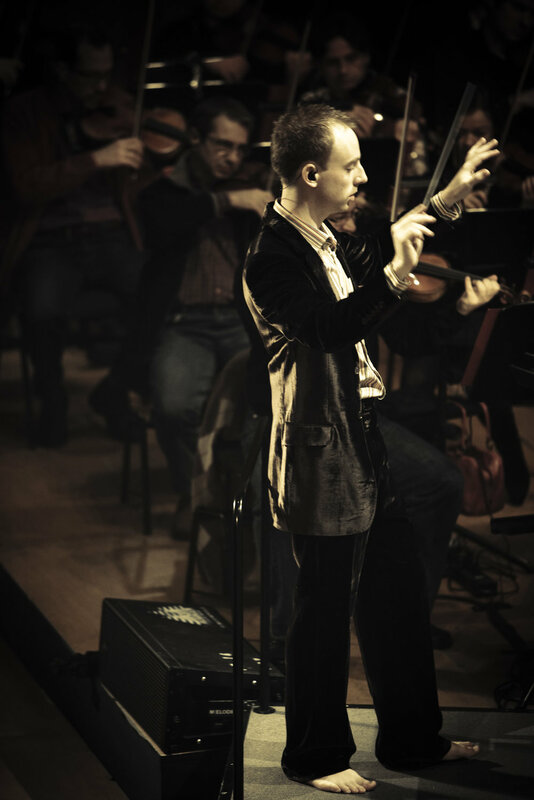 I was also conducting the Sinfonieorchester Basel. 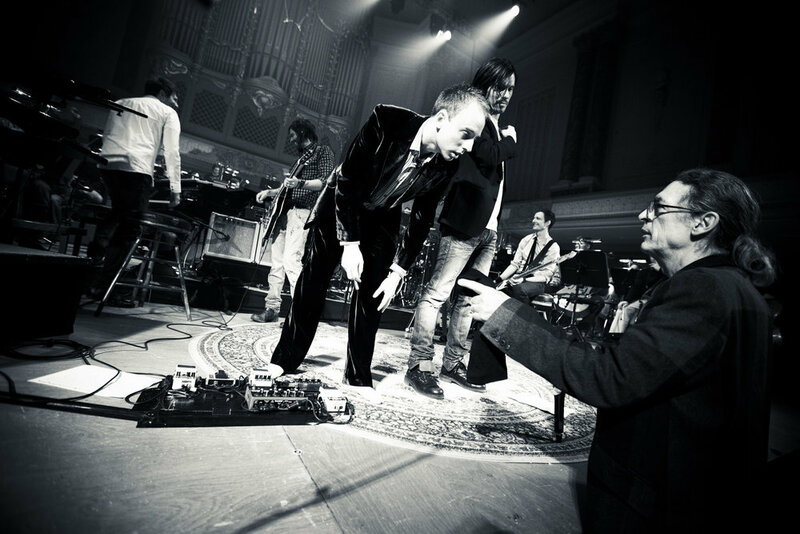 It was three performances of a European band called the Lovebugs, fused with one of the worlds great orchestras, resulting in a hybrid of rock energy with classical and filmic excitement. To make myself comfortable in long, arduous rehearsals, I often took my shoes and socks off; and I'm afraid to say, even wore shorts. I know you're disappointed and can't understand how someone could be so careless, but it's incredible how scruffy and Hagrid-esq performers are when they don't have an audience to play to. Now, fast-forward to three minutes before making my big entrance in front of a screaming, excited audience who range from the pre-pubescent through to the odd octogenarian. I'm doing my side-of-stage ritual. It's not a superstitious thing, and occasionally I don't need to do this, but sometimes I lack the energy to go and do my job. My theory is that a couple of hours before a performance, my body and mind start to go into a slumber of subconscious relaxation. I don't want to eat. Don't want to talk. Don't want to move. Actually, I don't want to do anything; especially go on stage. And that's the irony - because I love being on stage. I've learned by now that it's just my way of conserving the massive amount of energy needed to perform like a lunatic version of Jiminy Cricket. It's the calm before the storm. And with any storm, there needs some brewing time, like a good cuppa. My brewing time involves jumping up and down on the spot. Waving my arms in circles, and generally trying to make the stage management as uncomfortable as possible with my psychedelic movements. That puts a smile on my face and also fires up the starter motor for the energy I need. So back to the side of the stage and pre-pubescent octogenarian folk. I'm waiting to make my entrance when the promotor looks at me with horror. "What on earth are you doing?" he screamed at me. I froze. For the first time in my life, I thought I was going to be fired. I imagined Alan Trump or Donald Sugar peering around the corner with their wagging finger, but I didn't know why. "If you conduct in rehearsals bare-foot because you feel most comfortable, why don't you conduct in concerts bare-foot. Isn't it about time concert halls were less formal? Take those shoes and socks off right now and go have fun!" So I did. I went on stage and had the biggest buzz not only when the mixed-aged audience erupted, but with the second wave of applause that came when they saw my little bare feet. The next day, the front page of the Basler Zeitung had a photo of my feet, with a caption of 'the cool barefooted conductor'. I had no idea back then that feet were like Marmite. People either loved me conducting barefooted or hated it. There seemed to be nothing in between. Of course the attention it gave me with the second applause and the newspaper cover massaged my ego, so one could say I told a little white lie when I said I didn't do it for the publicity. But scouts honour, I didn't know that publicity would arise from something we all do at least once a day! Nevertheless, I'm not a fan of stirring up things (unless it's on the last Sunday before Advent), so I've decided, here and now, that I'll stop with the whole barefoot thing in concerts. I can't be bothered with the negativity around what should be a fun, laughable little quirk. So I'll say good luck to Clarkson with his beer-barrel and Kennedy with his football shirt; I hope they can continue with their fanciful follies. As for Dali, Shelly and Gould, it's interesting they are remembered not for their oddities, but for the creations they left us. Perhaps I should have learned from this, but then I wouldn't have been called 'the cool barefooted conductor'; and with all that patent leather and cotton, I'd be too hot. The Conductor - A fascinating novel; not the story of Shostakovich. This is the story of a man caught in the white heat of obsession. A man who inspired an entire city, much less a ragged orchestra of half-starved musicians, to an act of resistance and hope in a time of war. Karl Eliasberg. The Conductor. The Great Conductors - Most Popular Symphonies and Orchestral Favorites - A remarkable 30-CD collection brings together 30 world-class conductors representing the cream of crop - including Herbert von Karajan, Arturo Toscanini, Otto Klemperer, Pierre Monteux, Eugene Ormandy, Bruno Walter, Sir Thomas Beecham, Leonard Bernstein, Leopold Stokowski, Sir Georg Solti and George Szell. Weingartner: Complete Symphonies [Marko Letonja, Sinfonieorchester Basel] - Marko Letonja and the Basel Symphony Orchestra set out on this adventurous journey of discovery with devotion and virtuosic skill over these 7 disks. Felix Weingartner an internationally acclaimed conductor and a highly influential figure in Basel's music world he also bequeathed to posterity an extensive compositional oeuvre marked by timeless freshness. Stravinsky:Petrouchka [Sinfonieorchester Basel; Maki Namekawa, Dennis Russell Davies] - A beautiful recording of this incredible piece. Brucker: Complete Symphonies [Tapiola Sinfonietta; Northern Sinfonia; Sinfonieorchester Basel, Mario Venzago] - 10 CD’s and a DVD of Mario Venzago conducting.